In Acts 5 we have this very fascinating scripture that talks about Ananias and Sapphire lying to the Holy Spirit. There’s a lot of good things that the Lord showed me the last time I was reading it that I have never seen. In fact, I’ve never heard it preached from this scripture either. We find that there was this husband and wife that sold some property and wanted to give the money to the church – great. Wonderful! Awesome! These people were wanting to be a blessing, right? Well…possibly, but not from what these scriptures say. What we can get from the context of the scripture is that Ananias brought a part of the money that he sold this land for and “laid it at the apostles’ feet.” In the process, as we can gather, he told the apostles that the money was all that he received for the land, when in fact he got much more. Was this the only issue? No. Not at all. When did Ananias do this? If you’re a sharp Bible scholar, you’d say Acts 5. Open book test folks. So what comes before Acts 5? That’s right, Acts 4. Straight A’s across the board. So what happened in Acts 4? This was a thing. All these people in the church were selling their land and bringing the profits to the church leaders. So there was a lot of other people doing this. It was also a very public thing apparently. It wasn’t private. It wasn’t behind closed doors. It wasn’t an anonymous thing. And it seems that Ananias saw this and the same thing that happens today happened to him – he wanted to be like these other people. He saw someone else do something and so he wanted to do it. It is possible that the Lord spoke to these other people and told them to sell their land. Have you ever been in a service and someone gives a big offering or you hear about how the Lord told them to sell something (perhaps a car) and then God blesses them with a new whatever. And then you want that same thing. So you do it, and if it’s a car, you walk for a while. If it’s a big offering, you give a big offering, and end up behind on your bills for a while. It really seems that Ananias got in over his head, got His eyes off of God, and on natural things. It’s really sad. It’s also possible that he saw all of the attention these other people were getting and decided he wanted some of that, so he did what he did. We should take warning from Ananias and realize that just because God spoke to someone else or someone else did something, that doesn’t mean we should do it. They were able to sell their land and give all their money to the church, Ananias wasn’t. They had the self-discipline and heart to do so, he didn’t. We should also realize, if we haven’t already, that we should never do anything to be seen of others. The Bible says not to let the right hand see what the left hand is doing. This isn’t talking about going around looking like you stepped out of Bird Box. It means to do your good deeds to be seen by the Lord, and that’s it – no one else. It didn’t matter if Ananias gave all, none, or part of what he sold that land for. It was up to him. God sees the heart. This was a heart issue. And issues of the heart find their way to the surface somehow eventually. It doesn’t matter how big and offering you give. If you can’t afford to give a huge offering – don’t do it. Look at the woman at the well. She gave basically a penny and the Lord said she gave more than all the others. That’s because it’s a heart issue. Life is a heart issue. The Lord is looking at our hearts. That’s just Acts 5:1-2. Look at verse 3. It says, “But Peter said, “Ananias, why has Satan filled your heart to lie to the Holy Spirit and keep back part of the price of the land for yourself?” It says that Satan filled Ananias’ heart to lie to the Holy Spirit. But if you go to verse 4, it says, “While it remained, was it not your own? And after it was sold, was it not in your own control? Why have you conceived this thing in your heart? You have not lied to men but to God.” Here it says Ananias conceived the lie in his heart. So who was it – Satan or Ananias? It seems to be one of those contradictions. It seems. A good life lesson to learn is that there are no contradictions in the Bible. There’s just people with a lack of understanding about it. That goes for the whole Bible. Always stay with the Bible, not those who think they know the Bible and found the one time God messed up. He never does. But Back to Acts 4:3-4. It says, “Why has Satan filled your heart to lie” and “Why have you conceived this thing in your heart?” The word heart here in the Greek is actually used for thoughts. Satan is always trying to attack us and he does so with thoughts and ideas. He’ll send little thoughts and is so clever he won’t even say, “why don’t you do this…” No, he is more clever than that. He’ll say, “Why don’t I do that…” He’ll talk like it’s your own mind talking to you and if you don’t watch it, you’ll think it’s you. That’s why it’s so important to renew our mind with the Word of God. Then it’s totally clear that it’s not us because our thoughts will be lined up with the Word. We’ll have the mind of Christ, not the mind of an idiot (the idiot would be the devil, not you). Look what Matthew 6:31 says: “Therefore take no thought, saying,…” It says we take a thought by saying. Our words are powerful, more powerful than most of us realize. The Bible says life and death are in the power of the tongue. It says that we can have what we say. We take a thought by saying it. If we don’t say it, we won’t take it. We make it our own by saying it. Now there’s also the issue of dwelling on a thought – continually thinking about it. But when we do that, we will eventually start speaking it. We’ll give life to that thought and give it power. Thoughts left unspoken will die unborn. That’s why we must be careful what we think on and what we say. Acts 4:3 says that Satan filled Ananias’ heart. I’m sure he bombarded him with that thought. Any chance the devil has to take down a Christian, he will take it. So when Satan was throwing all that junk at Ananias, it was Satan conceiving it. But once Ananias took it – he said it, dwelt on it – it became his thought that he conceived. Satan doesn’t have to give us the entire plan for sin. He just has to give us a nudge in the right direction. We’ll fill in the gaps. Have you ever seen the movie Inception. In the movie, this group of people is trying to implant a thought in someone’s mind, but they don’t give him the thought. They give him little breadcrumbs that will lead him to make the thought his own. The devil does the same thing. He lets us take the thought. If it isn’t from God – don’t take it. Then there’s this little firecracker of truth: You have not lied to men but to God (v.4). Ananias was lying to God, not men. Have we ever stopped to think that when we lie, it’s not to a person or even ourself, but to God? Probably not. We probably don’t want to. If we did, we’d do it a lot less. When we lie, it’s God that sees it, God that hears it, and it’s actually us, as Christians, aligning ourselves up with the devil and not with God. The Bible says that the devil is the father of lies. So when we lie, we’re aligning ourselves up with the our Lord’s only enemy. Remember that next time when you think about letting a little white one or giant black one of middle sized green one out. A lie is a lie and when we do it, we align ourselves with the devil, and against God. Now it comes to the results of Ananias’ sin. He dropped dead. During the beginning of the church, God could not let anything go, because if he did, then there would be so much that would come in to destroy it before it even started. So we have the first account of sin entering the church. When Ananias sinned, the judgment of God was so quick and swift that Ananias’s sin was judged almost instantaneously. Does this mean that God killed Ananias? No. It means that God judged his sin and God’s judgement opened him up to the destroyer coming in and killing him. The Bible talks about this in the first Passover and in the book of Revelations. I know some people don’t like to think that God judges anymore, but that doesn’t agree with the Bible. I like to stay with the Bible. So time passed, about three hours the Bible says, until Sapphira came in. When she did, she was questioned the same as Ananias. In those three hours, it is sure that the Lord was dealing with her: don’t align yourself with the devil, don’t agree with your husband. Most likely she too had been baptized with the Holy Ghost. She was a tongue talker with the power of God, the ability of God inside of her. But she made the wrong choice and ended up joining her husband. No matter who it may be – your spouse, best friend, pastor, family members – if they decide to walk contrary to the Word of God – don’t go. Stay with God. Always stay with God. It doesn’t matter who it is or what it is – stay with God. No matter how great the pressure may be – stay with God. You may have to pray and ask God for strength, but stay with Him. The rewards are far greater. Now let me ask you a question: Who were Ananias and Sapphire? The Bible doesn’t really tell us much. It just says that there were these people. But it seems clear that they were part of the church in Jerusalem. They were part of the church where one of the main leaders was an apostle that knew Jesus personally and had great miracle-working power. And yet, we see what happened. We need to always remember that just because our pastor or other church members are strong in the faith or have a good relationship with God, that doesn’t mean we do. This couple was in the church that set the world on fire, and yet they’re more so known as being the first people in the church to die. Before Stephen was stoned and died, Ananias and Sapphira were casualties of Satan’s attacks against the church. Before the devil took Stephen out by moving in other people’s lives, he took Ananias and Saphirra out by moving in their thoughts. 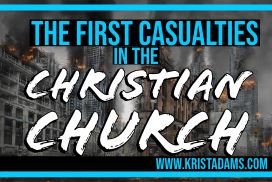 He started attacking the church, not from the outside, but from the inside – inside their minds. Again, that is why we must renew our minds and think on good things as Philippians 4 says. Just because you go to a good Word church where the Word is preach boldly, where signs and miracles happen often, that doesn’t mean you are a mature believer. Ananias and Sapphira still had to be a doer of the Word, and they weren’t. We still have to be a doer of the Word. We have to do what we know and study ourselves to find out what we’re not getting in the few hours a week at church. Though Ananias was the head of his family, Sapphira had her own decision to make. She could have told the truth. She could have easily (or was it?) said that the money they gave was just part of it. An issue that I’m sure she had (from my experience) is that her relationship with her husband was stronger and closer than her relationship with God. She was tied closer to her husband and what he did and said than to God and what he desired and even demanded. We have to make sure that the strongest relationship that we have is with our Lord and Savior. If not, people will pull us away from Him, turn us against Him, and cause us to align ourselves with His enemy. It happened for Sapphira. It happened for Samson. It has happened for Christians throughout time. That’s one reason why the Bible tells us to guard our heart. Matthew 6:21 says, “For where your treasure is, there your heart will be also.” What do you treasure more – your relationship with God or your spouse? Your relationship with God or looking like an idiot? It doesn’t say your treasure will follow your heart. It says your heart will follow your treasure. What do you treasure more? This account of what happened between Ananias, Sapphira and Peter was written for us to learn from. I believe that we should learn as much as we can and strive, with the help of God, to live our lives according to the Word, learning from the successes and failures of those in the Word. Just because something bad happened to someone in the Word, that doesn’t mean it should happen to us. We need to learn from their mistakes so we don’t repeat them. Stay with the Word and the Spirit.